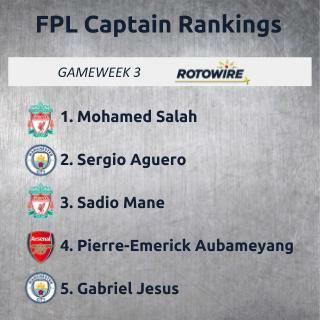 While all of the favorites took Gameweek 1, it was a bit different in Gameweek 2, though not by much. Manchester United were the only side involved in an upset, unless West Ham losing at home was a surprise to anyone. Man City took the weekend with six goals, three of them from Sergio Aguero, with Gabriel Jesus starting alongside him. Harry Kane laughed at the critics and added one late against Fulham. Richarlison and Sadio Mane each scored another, while Theo Walcott led the midfielders. The only place to misstep at captain was Christian Eriksen, as he wasn't involved directly in any of Tottenham's three goals. The upcoming gameweek again has some favorable fixtures, with the introduction of Arsenal to the rankings. The Gunners have had the most difficult start to the season, but that changes with a home match against West Ham, who have also lost their first two. Some will look at Henrikh Mkhitaryan for the armband after a goal and assist last weekend, but Pierre-Emerick Aubameyang scored in every home start last season except for the one against Man City. He had two shots on goal against the Blues and is in prime position to find the back of the net. In a similar spot and slightly easier to trust are Liverpool against Brighton. The Reds look ready to challenge for the Premier League title with Mane (three goals) and Mohamed Salah (goal, assist) leading the way. Mane has been great, but Salah is Salah and he has just as many shots on goal and one more chance created. Brighton just beat Man United, but they also lost 2-0 at Watford in the opener. This one could be a similar result, if not worse. It makes sense to throw Andrew Robertson and Trent Alexander-Arnold into the mix with good clean sheet odds, yet I don't know why you'd put either above Salah or Mane. As usual, Man City are also in the conversation with Aguero and Jesus the way to go, unless Pep Guardiola decides to go with a different look despite those two cruising last match. Aguero is the main goal scorer and I'm not putting anyone from City above him until he runs into some bad luck. He had nine shots (four on target) and Jesus had six shots (five on target) last match, so there may not be much to separate the two if the same lineup continues. Wolves were hyped going into the season, but they haven't shown much, failing to beat 10-man Everton and going scoreless at Leicester, who also went to 10 men with more than 20 minutes to go. Chelsea have a decent matchup at Newcastle, though it's not a guarantee who will score the goals unless you think Pedro can keep up his current pace. I'm never putting trust into Alvaro Morata away, and Eden Hazard still isn't ready for a full 90. That's about it for guys I want to captain, with Man United hosting Spurs. Bournemouth and Everton should produce goals, but it's not a great situation for either side. Aleksandar Mitrovic may be the best of the differentials at home against Burnley. If you think Troy Deeney can match the goal and assist from last match, he's in another good spot against Crystal Palace. Danny Ings could be thrown into the hat at home against Leicester. But again, I'm not risking any of these guys.